Sparkle and Shine: Eek a spot! So lately I have been on a skin kick. I find that for some reason I pick a certain feature and then go crazy primping it or cleaning it or grooming it or whatever else, and lately I have been all about the dermis. I have never really had bad break outs or acne but I do have some blackheads and my new mission has been to eliminate them completely. SO I have tried a few different things and I just thought I would review them for you. 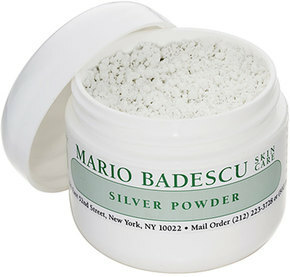 The first is this Mario Badescu Silver Powder. I got mine at ULTA for about twelve dollars. The jar doesn't look that big but I not feel like it is going to last me forever and I have used it several times. The way it works, or at least the way I interpret the back of the jar, is you shake a little of the powder out and then use a wet cotton ball and apply to clean skin. It creates a masque type thing that has a pretty good consistency. The down side is that every time you breathe in or out white powder goes every where including up your nose. Once you know what to expect it really isn't that bad and if you are careful you wont make a mess. This stuff is also super super hard to get off your face. The bottle tells you to use a cotton ball soaked in astringent to get the powder off. That soooo does not work. I have to use face wash and lots of water to get it off. When you look at your skin it looks amazing right away. However this is mostly because the white powder gets in your pores and makes them lighter, it doesn't get rid of the blackheads. However however this stuff actually does work. My skin was waaaay smoother and softer right away, it dried me up so I had no excess oils on my t zone, and my blackheads are getting smaller. This is not the miracle product that some say but it does work and it is worth the purchase. An even better tactic I found was to follow up the silver powder treatment with a Biore Pore Strip. Here is a little tip: I have tried the "ultra" strips and I have tried just the regular one and I can not find any difference in them besides the price; don't waste your money. The silver powder opens up the pores and this helps the little strips work like a billion times better. Another new product I have been trying is the Mary Kay Even Complexion Essence. I think that this product is supposed to work on age spots but the bottle does say that it can work on other things. For me it helps get rid of old zit spots, like the little red place you get when a blemish is not completely healed yet. It also has just helped with general red patches. I have noticed that since using this product I have had to wear less base and concealer, so generally im pretty happy. All of these things that I have been working on may not be visible changes to others because I usually just correct them with makeup. But I will say that its really nice not to have spend so much time covering things up with makeup and spending more time on the fun stuff like pigments. The key to good makeup is a good blank canvas to put it on. The way to get the best canvas is to have your skin be beautiful underneath! The week is almost over! Keep pushing to the weekend!